If you dream of launching your own business, but aren't sure what that business should be, microDomination has the answer. This new book from entrepreneur and communications guru Trevor Young, shows you how to tap into your particular area of expertise and build a small business around what you know and love. 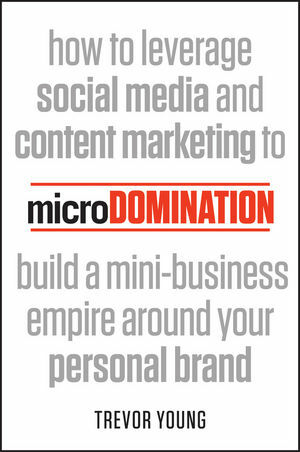 No matter what particular subject you're knowledgeable in, from dog training to cooking to financial planning, microDomination shows you how to build a brand around yourself and turn that brand and expertise into profits even from the comfort of your own home. In the first part of the book, Young uses real-life examples to introduce you to the businesspeople—or "micro mavens"—who are living their dreams and earning money doing what they love. The second part of the book reveals the nuts-and-bolts strategies and tactics you can use to emulate their success and achieve your goal of "microdominating." If you're stuck in a dead-end job or just dream of turning your hobby into a business, microDomination gives you a proven plan for turning your passion into prosperity. Trevor Young is a PR and social media specialist and keynote speaker with a solid track record working with major blue-chip brands, start-ups and fast-growth companies. In 2011, his blog PR Warrior was named by SmartCompany.com.au as one of the 25 Best Business Blogs in Australia. Visit www.trevoryoung.me or follow on Twitter @trevoryoung.